Union minister Anant Geete was the chief guest at the ACMA Tech Summit, organised in Pune on January 29-30. Also seen are Thomas Flack of Tata Motors and Ram Venkataramani, president, ACMA. The Automotive Component Manufacturers Association of India (ACMA), the apex body of the Auto Component Industry in India, successfully hosted the fourth edition of the ACMA Technology Summit on January 29 and 30 in Pune. With several technology disruptions including newer norms on emission, safety, and consumer trends towards connectivity on the anvil, the auto component industry needs to adapt and transform through systematic R&D, creation of new products and upgradation of skills to stay relevant and competitive. It is in this context that the Summit was themed ‘Indian Auto Component Industry – Transforming to stay competitive’. The summit was attended by eminent personalities including Union Minister Anant Geete, who represented the Department of Heavy Industries & Public Enterprises, Government of India; Thomas Flack, president and chief procurement officer, Tata Motors; Ram Venkatarmani, president, ACMA; Deepak Jain, vice-president, ACMA; F R Singhvi, chairman, ACMA Skilling and Mentoring and Vinnie Mehta, director general, ACMA. The fourth ACMA Technology Summit brought together national and international specialists in the field of Industry 4.0, telematics, innovative technologies that are shaping the automotive environment of tomorrow. The summit witnessed incisive sessions on Industry 4.0, Electric Mobility, artificial intelligence, retrofitting technologies and renewable energy among others, addressed by the distinguished industry luminaries, who stressed on improving quality and adopting new technologies with the concern for environment and sustainability. Additionally, the ACMA Awards were also given at the Summit. This year there were 224 applicants, of which 82 winners were awarded. The winners of ACMA award also shared their success stories at the annual event. 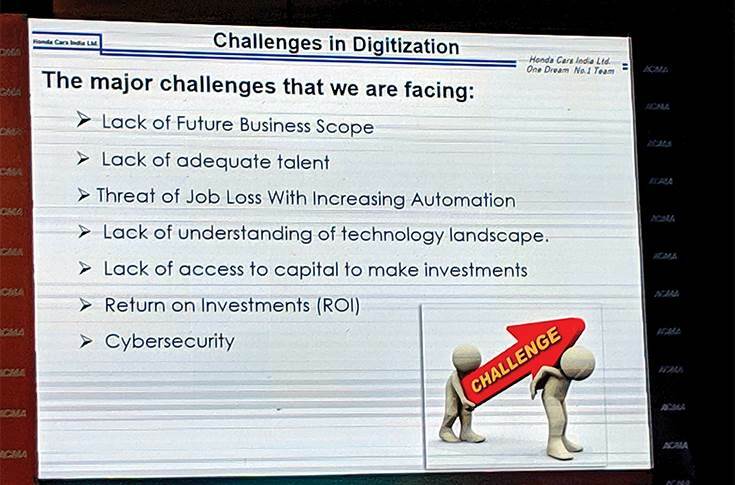 Lack of skilled talent, understanding of the tech landscape and threat of job losses with increasing automation are the biggest concerns amongst suppliers, suggested Rajesh Seth of Honda Cars India. The ACMA awards, since their inception in 1966, are today the most coveted awards in the automotive components sector. The awards, which began as a means to recognise and motivate excellence in manufacturing, have today 14 broad categories including excellence in manufacturing, exports performance, technology, quality and productivity, human resources, health safety and environment, automation, digitisation, business growth, resource optimisation and others to name a few. Several of these categories have been further curated to give special focus to small and medium enterprises (SMEs). 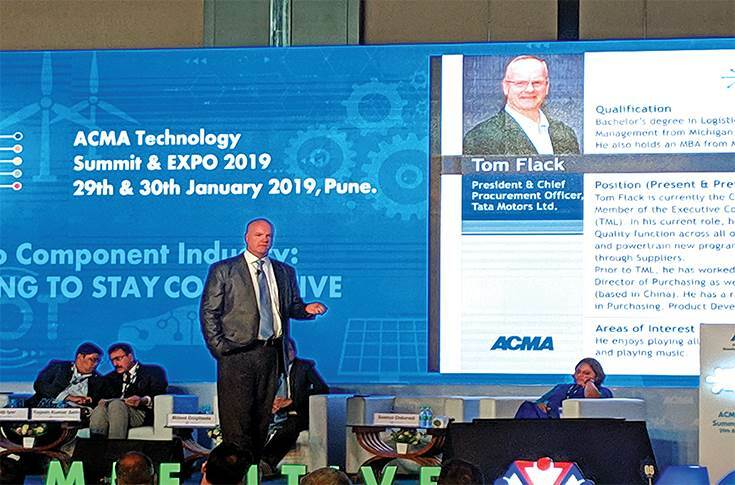 Commenting on the industry transformation, guest of honour, Tata Motors' Thomas Flack said, “The auto component industry must embrace the digital revolution to stay competitive and relevant. The time has come for the industry to graduate to Industry 4.0 for better predictability and addressing customer requirements. To capitalise on the opportunity, companies will need to shift from their traditional “disconnected” and “analogue” manufacturing methods to connected and digitised ones”. Commenting on the readiness of the value chain, Ram Venkatarmani, president, ACMA said, “While growth in the automotive industry is imminent, we however, need to ensure that the sector, especially our Tier 2s and Tier 3s are ready to harness newer opportunities. Tier 2s and 3s pose the single biggest challenge for us today and it is critical that they be upgraded to world-class levels of performance, especially on the front of quality, processes and delivery. Tier 1s will have to play the role of mentor and guide to this segment of the industry or else the entire value chain will collapse”. The event culminated with a panel discussion on Digitisation – Business Imperatives to drive efficiency in the supply chain. The 90-minute session titled 'Digitisation — Business Imperatives to drive the efficiency in the supply chain' was one of the key highlights of the two-day event. Moderated by Balaji Iyer, partner, McKinsey & Company, the sessions had heavyweights representing the OEMs as well as the component suppliers as panelists. The panelists included Thomas Flack of Tata Motors; Lalit Verma, senior vice president, CDMM – Automotive & Truck and Bus Division, Mahindra & Mahindra (M&M); DV Ranganath, senior vice-president – materials, Bajaj Auto; Rajesh Kumar Seth, general manager & divisional head – purchasing, Honda Cars India; Sowmya Chaturvedi, purchasing leader, Cummins India; Vishal Khanorkar, vice president – head of central purchase, Tata AutoComp Systems; Prashanth Doreswamy, MD, Continental Automotive Components India and Milind Doiphode, general manager – procurement and supplier quality, Mercedes- Benz India. Honda Cars India also suggested that component suppliers make timely investments in digitisation to identify and reduce inefficiencies across the automotive supply chain process. According to Verma, these evolving demands from the young customers are impacting the production and supply chain practices due to several critical factors, which are flexibility in manufacturing, optimised inventory, supply chain risk management, disciplined and consistent manufacturing, made to order, customised product design, best-in-class quality, shorter development time and others. “Just like how two years ago, industry stakeholders were debating on the requirement of the best-in-class quality and costs associated with it and now no one debates it anymore, today we are debating the need for investing in digitisation, internet of things and Industry 4.0. Very soon a time will come when everyone in the value chain will be convinced that these are important elements to attain maximum efficiency across processes in the longer run,” Verma remarked. 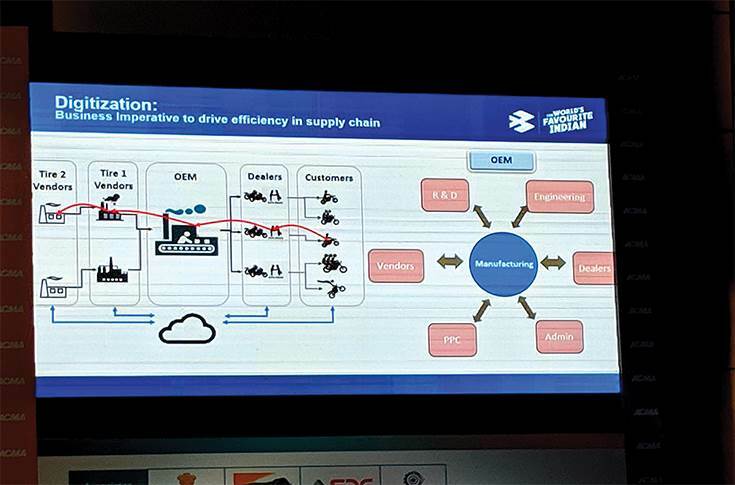 He disclosed that Tata AutoComp is working on such a conceptual model, which can lead to a proper digitisation of the supply chain in the foreseeable future. Questioning the audience about suppliers having access to the right processes and foundations to take on the incoming challenges around increasing costs, new mandates, required quality benchmarks and others, Doreswamy of Continental Automotive Components India attempted to explain the importance of investments in internet of things (IoT) and digitisation across the supply chain. He also spoke about how his company is increasingly gaining visibility of the supply chain processes using data and is working on fixing inefficiencies, thanks to the deployment of Industry 4.0. Tata Motors' Tom Flack pointed that very few Indian suppliers are pushing their engineering boundaries, they are averse to risks due to market fluctuations. He says investing in IoT is minimising future risks. Ranganath of Bajaj Auto was another speaker who spoke about notable points. He said that manufacturing operations are at the centre of the entire automotive value chain that involves R&D, engineering, cooperation with vendors, dealers, administration and other jobs. According to him, IoT as an application has meaningful impact on three aspects: operational efficiency, enhanced business models and new customer experience. “Some of the important benefits from IoT seen at Bajaj Auto include workforce productivity enhancement (via machine automation, machine monitoring and predictive maintenance, production testing equipment), remote monitoring and control of operations (factory environmental monitoring such as waste water management, energy management) and other areas,” he said. Bajaj Auto has seen a sharp increase in the rate of automation over years. While in 2008, only 4 percent of all welding processes were automated and 96 percent were manually done, the automation rate jumped to 85 percent in 2018 and the remaining 15 percent of all welding processes were manually carried out. According to Ranganath, this has fetched (shopfloor) benefits to the company in the form of a 100 percent improvement in the output per man and about a 40 percent decline in the throughput time. He also highlighted several other benefits of digitising the supply chain including asset management wherein physical inventory verification can be carried out, real-time tracking of equipment position among others. 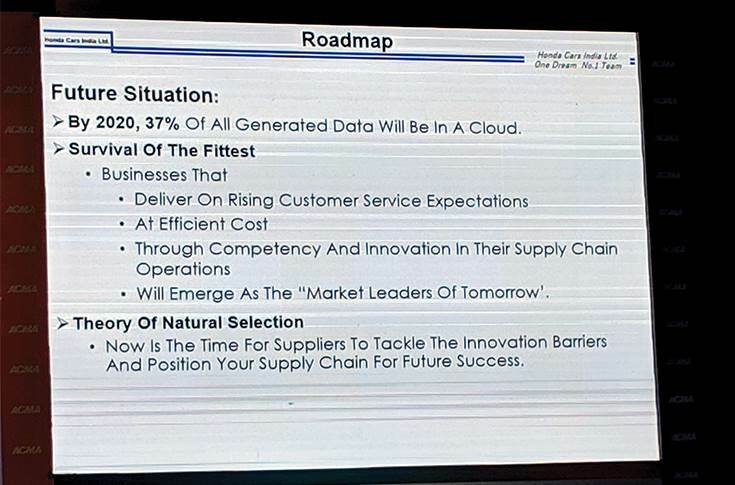 Giving his outlook on the subject, Seth of Honda Cars India, reiterated that the auto OEMs are increasingly outsourcing their non-core activities wherein business partners assume a greater role in the supply chain processes. “The OEMs must encourage the suppliers and business partners to embrace digitisation. OEMs and Tier 1 suppliers can come together to work on digitising the supply chain. The Tier 1 suppliers should support the Tier 2 and 3 partners to invest in the same. A supplier park can be created in the vicinity of the OEMs, who can in turn monitor the supplier processes time-to-time,” Seth suggested. Bajaj Auto feels vehicle manufacturing is the central operation of the automotive value chain, which includes R&D, engineering and product development, cooperation with vendors, dealers and others. Known for making clear and straight remarks, Flack of Tata Motors too stressed on the need to digitise the supply chain. “There are very few suppliers who are pushing their boundaries currently. They are averse to risks, given the market fluctuations. However, I won't blame them because that’s how the industry dynamics are (in India). The technology changes are so fast now that we are clubbing our activities with our partners to work on new models. We have also doubled the number of tech days that we used to organise earlier. Investing in IoT is like minimising the risks that the future has to offer,” he commented. All in all, the session was well attended and it appeared that the smaller stakeholders in attendance were opening up to accepting the need for investing in digitising their respective supply chain processes.